Hennessey reveals the HPE1000 Supercharged 2014 Corvette C7 upgrade that offers more power than any Stingray should have. When we found out the all-new 2014 Chevrolet Corvette C7 Stingray was getting 5-10 horsepower more than what GM had originally told us, everyone got excited. The new C7 is the most powerful standard Corvette ever produced by Chevrolet. But Hennessey has taken the new 2014 Corvette Stingray and given it a 1000 horsepower upgrade that makes it one of the fastest sports cars on the planet. We knew it was coming, but Hennessey has just released official details on the high-performance upgrade that turns the new Corvette into an incredible machine. The supercharged twin-turbo HPE1000 package will cost $67,950 for the total mind-numbing upgrade not including the car. Of course Hennessey will guarantee the new C7 package will pump out an incredible 1000 hp at 6,300 rpm. 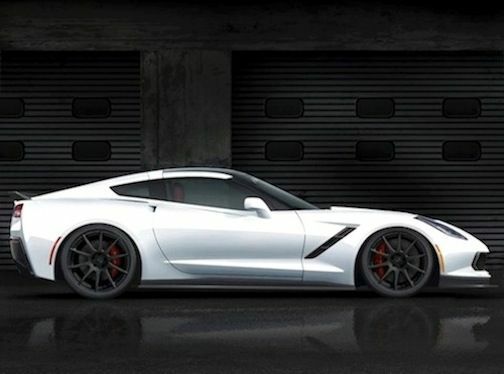 That’s a scary figure when you consider the stock 2014 Corvette comes with 460 hp with the performance exhaust system. The HPE1000 will come with internal performance goodies like forged aluminum pistons, forged steel crank and rods, and a custom camshaft. The custom balanced and forged engine, also comes with twin turbochargers, high-flow cylinder heads, fuel system upgrade, and custom intake and exhaust systems. Hennessey will professionally install everything on your C7 and calibrate the upgrades and then dyno test it to make sure everything is performing properly. They will then track test the ultimate Corvette upgrade and finally install serial-numbered dash and engine plaques and exterior badging to let the competition know not to mess with this supercar. Additional upgrades are available like a CarbonAero body kit for increased aerodynamics at top speeds, Monoblock wheels, Michelin high-performance sport tires, Brembo brake upgrade and Penske suspension upgrades. There are also custom leather interior treatments and carbon fiber trim options to set the Corvette apart. If 1000 hp is too much, Hennessey offers something for everyone with other performance packages like the HPE800 Twin Turbo ($54,950) with 800hp, HPE700 Supercharged ($18,450) 700hp and the HPE600 Supercarged ($12,495) 600hp upgrades. All upgrades are street-legal and will run on 93 octane fuel but are not California emissions compliant.